No other product on the market can come close to EPDM rubber. It's the most versatile, longest-lasting materials manufactured just for the great outdoors. Both EPDM Liquid Rubber and EPDM Liquid Roof are 100% genuine Liquid EPDM rubbers. These products are simple to apply, boast a slow cure time and are completely water resistant. Are you working with steel or regularly expose your roof to salt water? EPDM is highly effective even with these conditions. Roof leak repair used to be a tedious, difficult chore. You might have even depended on a professional to do it for you. However, it's now very easy and a true DIY project. EPDM coatings are a strong, cost effective roof repair solution no matter what material you're working with. When you're a homeowner, you have certain responsibilities. It's nearly guaranteed that you'll have to deal with a roof repair in your lifetime. Holes, leaks, dents and broken shingles happen. You can use Liquid EPDM Rubber on rusted or worn metals without needing a primer. Improve appearance and retain your home's value. There's only one liquid EPDM option on the market for roof coatings and leaks. Enjoy the immense benefits, like flexibility even with extreme temperature swings. Liquid EPDMs are UV resistant and drastically slows down any deterioration. It's not just a fantastic vapor and gas barrier Liquid Rubber uses the best waterproofing agents available. This incredible material can be used in temperatures ranging from -60° F to over 300° F. It protects against corrosion, is acid resistant, and easy to repair. Salt and saltwater doesn't impact it and it can stand up to cathodic disbondment. You might notice that Liquid EPDM is available in white, gray and black. 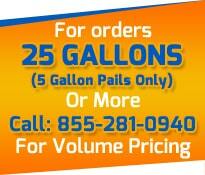 However, you can customize your Liquid Rubber to any color you'd like when you order over 100 gallons. Your unique Liquid Roofing can be tailored to any color of the rainbow. If you don�t need 100+ gallons, you can paint over Liquid EPDM. Painting is only effective after the curing process is complete, so it's important to wait at least one full month. Prep the area by washing the surface with mineral spirits or xylene before applying acrylic or polyurethane paint. When building a new home, sealants and caulks can be protected with EPDM Liquid Rubber. This simple process helps extend the life of sealants. You can also extend the life of metal roofs. However, even if you�re home isn't recently built, you can still extend the existing life of sealants and metal roofs by applying EPDM. Increase the life and value of any roof whether you're working with concrete, wood, rubber, metal, fiberglass, foam or fabric. There are some rules when using Liquid Rubber with concrete. Not all concrete works well with EPDM. Check to make sure your masonry or concrete isn't porous or absorb liquids. Brick has a tendency to absorb Liquid Rubber. You can still use EPDM rubbers. Simply apply a non-glossy paint first, allow it to dry, and then apply Liquid Rubber. Sheet rubber and EPDM have many similarities, including flexibility and chemical makeup. This is a great match, and you don't have to worry about chalking. Applying Liquid EPDM Roof over sheet rubber can fix any existing chalking issues. However, you need to be careful when working with these two materials. The sheet rubber needs to be properly glued to wood beforehand. Otherwise, issues like bubbling and swelling can occur. Don't worry if this happens. It can take many weeks for the curing process to complete, and the swelling will subside. Extreme temperatures can exacerbate this problem, so patience is necessary. How Many EPDM Coats Do I Need? Liquid EPDM is a one-coat application. One solid, thick coat is better than numerous thinner coats. Applying numerous coats can lead to wrinkling, especially if the first coat isn't entirely cured. Remember that curing can take several weeks depending on temperatures. Apply thicker coats if desired, but remember that thicker coats require longer curing. Asphalt is unstable, and not recommended with Liquid EPDM Rubber. Instead, use a elastomeric that is designed specifically for use with asphalt. Our elastomerics can extend the life of your asphalt roof by 10 years. Have you tried dozens of roof repairs, and you're still not satisfied? Your RV takes a beating, especially if you're constantly on the road. You should only have to repair roof leaks once. Most RVs have no less than five openings. The vents and skylights can lead to damaging leaks if the flashing isn't in top condition. Seams on your roof are also prone to leaking. When you purchase a new RV, manufacturers use butyl rubber or acrylic to caulk around these openings. This will work for awhile. However, these sealants aren't designed to last more than five years. Rough winters and sun exposure can quickly wear down sealants. Applying EPDM Liquid Roof over these sealants can help drastically extend the life of your room and quickly fix leaks. Roofs have a tendency to collect water, especially if you live in a particularly wet region. Temperature extremes can cause flexing and shrinkage that traditional caulks and sealants can't withstand after a few years. Note: Do not use EPDM Liquid Roof with cream-colored ALPHA rubber. Check with the manufacturer for the best roof repair solution with this particular material. Are you looking for the end-all solution to protecting your fish or plant life? Our PondPro 2000 can be used to waterproof fish ponds, repair leaks, and protect pond liners, fountains or decorative pools. You should only have to repair your pond once. You might know about the great reputation of Liquid EPDM rubbers, and now you can get the exact same quality in liquid form. Ponds come in many unique shapes and sizes. Liquid EPDM conforms to any shape and provides an easy, smooth waterproof surface. Concrete is a popular options for ponds and pools, but it can absorb water. You have to make concrete complete water resistant. Liquid EPDM can do this, plus protect against UV radiation, sun damage and extreme temperature drops. Drain all water first and remove dirt while the concrete is wet. Use a high pressure water spray to remove remaining dirt. A wire brush is best in fish ponds. Properly remove algae with a cleaner designed for it, or with a 1:4 bleach and water solution. The pond should be allowed to dry naturally, which usually takes one week if there are no rain showers. Curing times can vary depending on the temperature of your region. Koi ponds usually take one week to fully cure, assuming the temperature is above 70° F. Rinse the koi pond several times before reintroducing the fish. Follow normal directions for introducing koi fish into a new pond. EPDM Liquid Rubber can work with any pond, whether rubber, plastic or concrete. Fix leaks quickly. Plastic pond liners tear and crack, and other sealants are prone to weathering. EPDM doesn't. It's completely safe for fish, and will help ensure that you don't need to needless stress the fish to keep repairing the same leak. You can apply Liquid Rubber directly onto plywood to create a finished look. It's low cost, easy and beautiful. Keep in mind that only using plywood as a roof isn't the strongest solution. However, if that's your choice, EPDM Liquid can give you a completely waterproofed finish. Ensure that joints between sheets are positioned over a roof truss and secured to avoid warping in the future. Plywood should be coated with an oil-based primer to seal the pores. Primer should be cured in 24 hours. A primer can drastically improve the appearance of the finished roof. Use a 6-inch polyester strip to bridge the joints. Now you're ready to apply a thing coat of EPDM rubber directly over the joint. Put the fabric into the liquid and remove any wrinkles. A liberal coat of Liquid Rubber can now be applied over the entire roof. Be careful when applying EPDM over the fabric. Wood is the only material that requires a primer. When working with wood, you may want to thin the EPDM with one cup of paint thinner per gallon. Avoid using silicone or an oil-based material on wood. Otherwise, you can apply EPDM Liquid to virtually any surface, and customize it to any color.